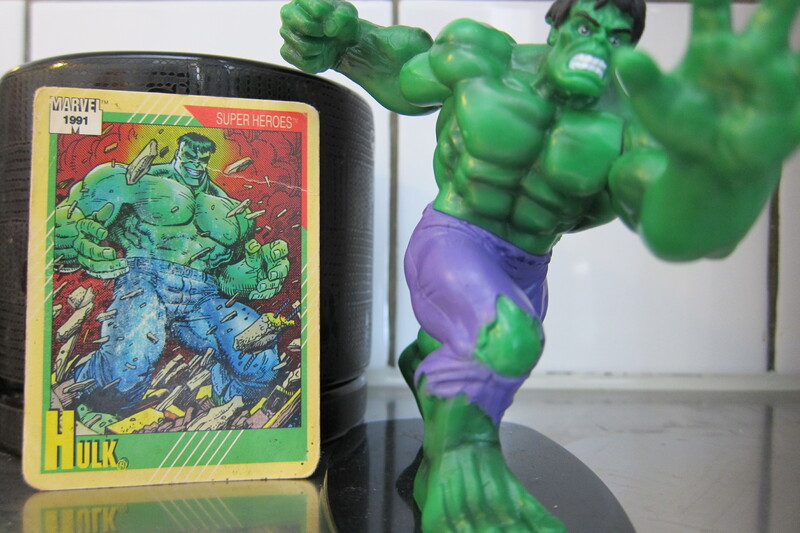 Comic card meets Action figurine. To be honest, over the past few months there has been growing tension between my eldest son, K and myself. For one, he is continually testing his independence and boundaries as he is of that age. For another, we are way too much a like, which might have something to do with us sharing the same birthday. Another, we are both very physical individuals. This has all been well and good until K’s little brother, M, began to be much more mobile (he is walking quite well now) and more opinionated and demanding. With this, K has been lashing out at his younger brother, sometimes on purpose, but often without even thinking about it. I in turn am forced to physically remove K from M and find that I am often reprimanding K more than providing the positive reinforcement he deserves. Another factor is that until this year, K has mostly had mommy at home and has a very strong connection with her. As I am now the stay at home parent, our relationship has strengthened…until these past few months, which resembled something akin to the Cold War. While not outright hostile, not exactly friendly either. 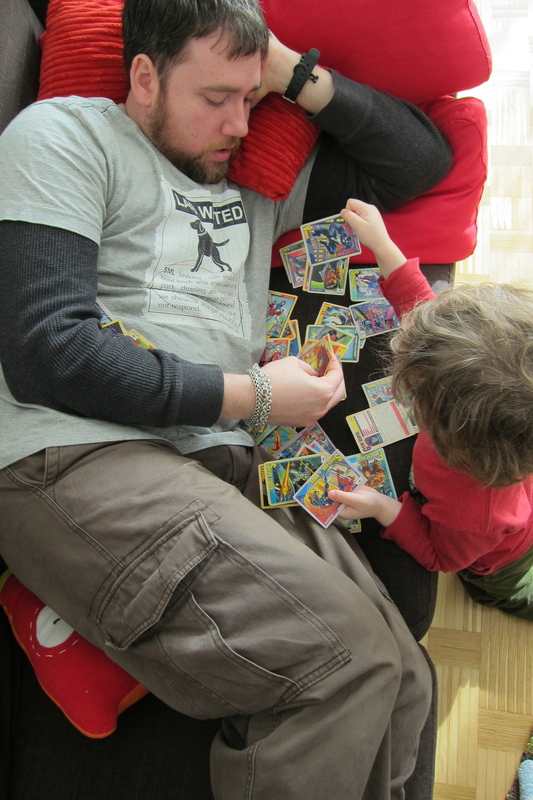 Bonding over old Marvel trading cards. Now enter Marvel. At some point in the early 1990’s, my parents picked up a pack of Marvel Comic character trading cards from a garage sale. I never really read comics or followed them at all (to which I regret now), but I do remember reading through these cards and playing out various scenarios with them in my head. Randomly, as I was sifting through the tons of boxes my parents have kept for me when I was preparing to move to Sweden, I came across those cards and decided to pack them in and bring them to Sweden. A few weeks ago, I pulled them out as M was taking his morning nap in an effort to keep K occupied and quiet long enough not to wake his little brother. Very quickly, K has made this a father/son bonding experience. Now, every weekend when K is home for M’s morning nap, he pleads for us to put M down to sleep sooner so that he and I can look through the cards. We sit together, maybe on his bed, on the couch, or even the floor somewhere and sort through them. Which ones are good guys, which ones are bad? Which ones show conflict? What is causing the conflict? What family groups can we put them into? Etc etc. It’s a bit challenging, as K is still only three years old and his mom and I have been trying our hardest to minimize his exposure to violence and fighting. But he is in preschool, and he now loves the bad guys…because fighting is bad, so only the bad guys would fight. Now all of a sudden I am trying to explain, with reservations, that sometime to uphold justice and protect those that are weak, good guys might fight too if they have to. It is a big slippery slop that I am on, but the sled is starting to go, so I might as well try to direct it a bit. All in all, these Marvel Superhero cards has created a bridge between my son and I, it has allowed us to have something special that we share and bond over. And honestly, I am very happy to help direct my son down the comic path, the one I regret not exploring when I was a youth myself. So thank you Marvel, not only do I now have a good excuse to start embracing my inner neglected nerd self, I also get to bond with my son at the same time.